MainAll NewsMiddle EastWill Trump demand complete Iranian withdrawal from Syria? Will Trump demand complete Iranian withdrawal from Syria? Diplomat tells London newspaper that upcoming Trump-Putin summit will focus on complete Iranian withdrawal from Syria. 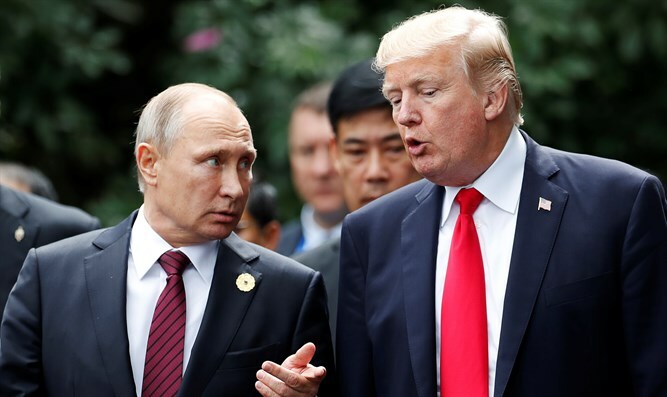 US President Donald Trump at an upcoming summit will demand Russian President Vladimir Putin agree to force Iran to completely withdraw its forces from Syria, London's Al-Hayat newspaper reported Thursday. On Thursday, the White House Press Secretary announced that the summit is scheduled for July 16, and will take place in Helsinki, Finland. Al-Hayat quoted an unnamed Western diplomat who said, "If the Putin-Trump summit is held on July 15, its core will be to negotiate Washington’s insistence on Iran’s withdrawal from Syria." Putin, he said, is not willing to "pay a heavy price" for Iran's presence in the area, and Jordan also opposes having Iran on its borders. The diplomat also said Trump does not oppose Syrian President Bashar al-Assad remaining in power, but would give Israel the "green light" to freely attack "any Iranian presence in Syria, wherever and however Israel wants to."